This beautiful little white or ivory fine cotton knit sweater is made by Will'beth, a leading designer of beautifully detailed children's clothing for more than 30 years. 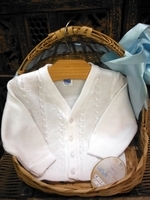 It features lovely cable stitching on the front, a v-neck, and cardigan styling. 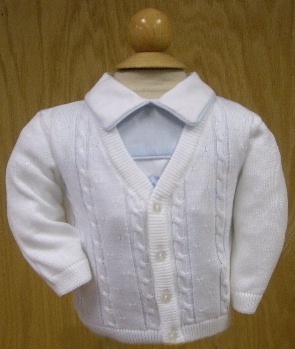 This year round sweater buttons down the front with four little square pearl buttons. The most beautiful little sweater for bringing your new baby boy home from the hospital, your baby or toddler boy's baptism christening, or for any special occasion!